So today is Summer Solstice! That means summer has finally arrived (if only in terms of dates rather than weather!) and I thought it would be the perfect day to do a round up on all the latest SPF products that are on my radar at the moment, from new ranges, new products and whole new brands available in the UK! This new collection to NYR features brand new SPF products for body and face. The Lemongrass Moisturising body range consists of SPF 15, 30 and 50 (50ml & 150ml) all in a delicious Lemongrass scent, 100% natural and UVA/UVB and water-resistant! There is also a Wild Rose Moisturising SPF specifically designed for the face which is SPF 30 (50ml) which provides UVA/UVB PA+++ protection! I'm really excited about this collection as I'm always using and loving NYR products so this is really great news! This is a bit of a relaunch for Green People, originally this formula was SPF 25 and smelt a little like play dough! I have several bottles of this in both travel and full size and I didn't mind the scent! I loved the protection this gave me and have been using the original for years so I'll be super interested to see how both the protection and the 'smell-factor' have improved with this new formula! Again both UVA/UVB protection, this is also suitable for sensitive skin! A very exciting American brand that has now launched in the UK thanks to the amazing team at abeautifulworld! 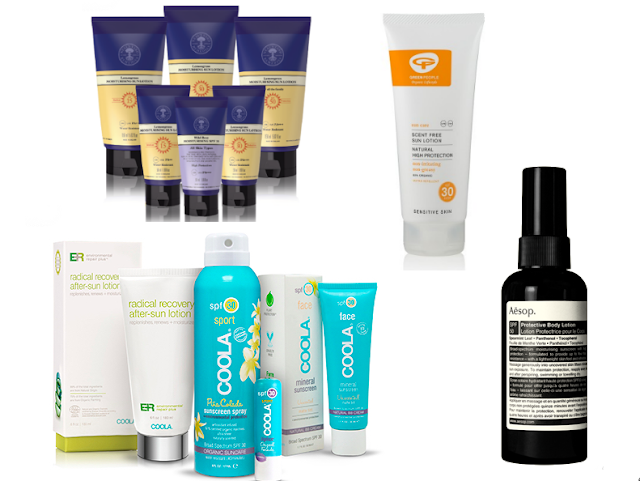 COOLA offers a huge range of amazing products for the whole body for sun care from your typical sun creams, to aftersun and BB Creams! It is worth a note that they do have some ingredients that you may want to look into first as they aren't the 'cleanest' of products - but if they were selected by abeautifulworld then I'm happy! I've really got my eye on the Environmental Repair Plus Radical Recovery After Sun Lotion! This Aesop Protestive Body Lotion was launched at the beginning of the year and I've been waiting eagerly to get on my summer holidays for months now to test it out! This body lotion provides SPF 50 UVA & UVB protection and can provide water resistance for up to 80 minutes. The formula is also infused with Spearmint so it has an incredible scent, I adore anything minty! Again some of the ingredients are not 100% clean but it's pretty close! Available in 150ml. Have any of these new products or brands caught your eye? I have my eyes on NYR's new sun lotions at the moment and I am just waiting for them to be available to buy. I love the brand and I am hoping to buy one of their new sunscreens before I go on holiday in two weeks time. I've used Green People's sunscreen in the past but then there's been this news about nano particles which they use in their sunscreens although they say it's safe.. Never heard of Coola before but I will definitely check them out now! I've heard a lot about Coola but will definitely be checking out the ingredients first! I love Neals Yard Remedies - didn't know they did sun protection so I will most definitely be checking that out!! Great reviews going to try the Neals yard and green people ones!